Currently we have a very heavy rain belt situated over the south of England, with a particularly heavy band pushing up the M5 corridor down in the south west. This rain will slowly move northwards over the course of the day and in places I’d expect 30-40mm or more. Here currently (13.01 p.m.) it’s nearly dark and raining very heavily. The rain front is set to rotate over the U.K and push westwards into Ireland later on, bringing rain to Connacht and Leinster early doors Tuesday, before pushing southwards through the day into Munster. Tuesday sees that heavy rain pinned down over the north of England / Scotland in a line stretching from Birmingham north, so south of that, a much better day initially, but later on in the day, the rain pushes southwards and intensifies, so I expect heavy localised rain for the north-west Midlands and north of it (Manchester / Leeds area) a.m, pushing south into the south-west and home counties p.m. Wednesday sees that rain lingering west Leinster / Munster and down the west / south-west of the U.K. During the day, it consolidates and moves inland, so again p.m. could be wet for most areas. Winds will remain strong over Tuesday and Wednesday and primarily from the south-west, tending southerly. By Thursday, things are beginning to settle down as that low begins to lose its strength, so a much drier day in prospect for all areas of the U.K and Ireland with only a risk of showers in the south-west and south coast, but these will be later on in the day. Winds will lessen, but it’ll remain on the cool side. For Friday, we have a weak band of rain coming down from the north west, reaching Ireland and Scotland in the early hours and pushing south and eastwards. So after a dry start, we’ll have showers bubbling up later in the morning for Wales and the west of England, pushing inland later in the day. For the weekend, I think it’ll be a reversal of last week, with Saturday a day of sunshine and showers, but feeling milder in the south. By Sunday temperatures will be on the up, nothing barmy like, but nice all the same and that’s what I think may trigger aggressive Fusarium. Next week looks to be a week of sunshine and showers with a milder south-westerly wind direction and the U.K and Ireland split into two halves, with warmer air in the south and cooler, wetter air in the north and Scotland. Moisture never looks far away, but it may be that the end of the week is wettest, with another low pressure on the horizon. Temperature-wise, I would expect high teens in the south at least and that’s what will kick off the Fusarium after this weeks moisture. The key area for me is timing of preventative fungicides with milder weather on the horizon and a saturated rootzone this week for many places. I appreciate many of you may have already applied a fungicide in early September (particularly Ireland where Fusarium starts 3-4 weeks earlier than in the U.K in general,in most, but not every year) to suppress disease active earlier in the month. Many of those applications would have been for Fusarium, but also Anthracnose Foliar Blight (more on this later), so if you’ve already applied Azoxystrobin for example, don’t fall into the trap that you’re covered for Fusarium because that chemistry isn’t the strongest on this disease, despite what the marketing blurb we read says…For preventative applications on this disease, the research and end-user feedback strongly suggests a chemistry from the DMI family is most effective, so that’s Propiconazole, Tebuconazole, Prochloraz.. Looking at the weather forecast I think the application window should be Thursday or Friday for a preventative fungicide and that then sets the first one in place for end September / early October. I’d then look to repeat no later than 5 weeks after this first application, so that’s the 1st week of November. By following this frequency, you’ll span the next 10 or so weeks, which always represent the maximum Fusarium pressure on our calendar. By keeping disease populations to a minimum during this period, experience and trial results show that you siginficantly decrease the risk of aggressive winter Fusarium during December, January and February. On the right of this page, under Turfgrass Disease Information, you can read a more comprehensive explanation of the theory and the trial results that support both the fungicidal and non-fungicidal approach to disease management by Headland Amenity. Earlier, I mentioned Anthracnose Foliar Blight which has been doing the rounds now for the last month, not just in the U.K, but also on the continent where I visited Germany and Austria last week. This disease is a tricky one because it tends to come in quite fast (unlike the basal rot form which is slower) and particularly on areas of grass under stress. This entry was posted in Mark Hunt's Weatherblog on September 24, 2012 by mark.hunt. After not a bad weekend, the gentle slip into autumn continues, with some chilly mornings,heavy dews and a pretty cool interlude on the horizon. As you can see from the graphic (right), we’re still in essentially the same jet-stream trough pattern that has dictated our weather since the 1st week of April. The issue going forward is that if it remains so, the weather it’ll bring down will be unseasonably cold for this time of year. The weekend looks to be a cool affair as that cold trough sinks south, with strong south-westerly winds and potentially some heavy rain for Sunday, so not great really. For the start of next week, that cold low is weakening so winds will drop, but that may well pave the way for some chilly nights and I wouldn’t be surprised if we don’t get a ground frost or two if skies clear that is. So dry and cold for next week I think and maybe pretty dull as well. No.1 topic for this week is the huge amount of Fairy Ring and Thatch Fungus doing the rounds over the last 7-10 days, with lots of greens affected. The latter can be an inaccurate description because you don’t have to have excessive thatch to have Thatch Fungus. That said as the picture shows below, it does a great job of taking out organic matter, so rather than see these as a blemish, look at them as an indicator that there is an organic matter fraction in the surface of the greens that’s providing a food source. To determine if that organic matter level is excessive, push down on the affected area and if it depresses significantly, then you do have too much surface fibre. An interesting aside is that the picture above was taken at the end of November, 2006, so some species of thatch fungus are clearly active at low soil temperatures. With respect to treatment, I’d just make sure the affected areas don’t stand out significantly by maintaining adequate nutrition and iron applications. If possible solid tine and apply a penetrant wetting agent to neutralise any hydrophobicity present and prevent ammonia accumulation. One issue that may occur on higher surface fibre greens, is that you may get more heave on thatch-fungus affected areas when running over the affected areas during hollow coring or tining. The Superficial Fairy Rings tend to be less problematic at this time of year and often fade naturally as temperatures drop (which they will do soon) so no need in my mind to reach for the fungicide, except in extreme situations and even then treatment isn’t fantastically effective with Azoxystrobin. Out walking at the weekend I noticed the high levels of Yellow Rust (see boot) present on coarser grasses. This is often the case at this time of year, particularly during a dry spell and it tends to affect semi and uncut rough areas most. Rust is linked to growth and hence fertility, but normally once we get rain and some natural growth, it grows out. This entry was posted in Mark Hunt's Weatherblog on September 17, 2012 by Paul Vipond. After a hot, dry week with high humidity, we have a change on the way, but I don’t think it’s going to signal the start of autumn in earnest. This time of year our weather is typically affected by the remnants of tropical storms that move up the eastern seaboard of the United States, cross the Atlantic and push down into Europe. Their effect is dependent on the location of the jet stream – If it is sitting low then these lows push down and bring wet and windy weather, if it is high, they tend to only affect the north of the U.K and Ireland. As it looks at the moment, we’re likely to get the wind from these systems, but not alot of rain for the south of the U.K. It’ll also feel cooler, particularly on Tuesday, Wednesday, before temperatures recover. For the start of the week, we have a low pressure system pushing rain into Ireland and the west coast of the U.K. Primarily this rain will affect Munster, Leinster and a line up from Nottingham to Newcastle, otherwise it’ll be dry, overcast, with the risk of showers increasing overnight into Tuesday for southern areas. Tuesday starts dull and noticeably cooler as that wind swings round to the north and pushes rain south early doors. Later in the day, showers will bubble up across Connacht, Munster and Leinster and the west coast of the U.K but these will dissipate overnight for most areas, except western Scotland. As we start Wednesday, that rain in Scotland will push further south on the back of brisk, north-westerly to westerly winds, so it’ll feel a little nippy in the wind. As we go into Thursday, the winds swing round to the west and increase in strength, but it should be dry over most area of the U.K and Ireland and temperatures will recover slightly from mid to high teens. For the end of the week, it’s slightly tricky as currently the severe low pressure looks to affect the north of the country with very strong westerly winds and some rain, whereas the south should be warmer with only a low risk of rain and recovering temperatures. At this stage, the weekend looks reasonable, particularly the further south you are, with declining winds and nice temperatures. Further north, it’ll be windier and cooler as the low pressure system has more effect here. It’s a similar picture across Ireland with the north of the country most affected by the wind and rain. For the start of next week, the low pressure system moves away and a weak high pressure pushes up to give settled conditions through to mid-week, so fine and dry. Last weeks high temperatures have dried a lot of areas out quite quickly from the previous weeks rain and hand watering is the order of the day here. Soil temperatures remain around the 16°C mark, so still quite favourable, with growth just ticking on nicely for greens. Last weeks dry week will have given most people a chance to get on top of outfield areas and with a light rainfall week expected for most areas, that process should continue. Disease is quite prevalent given the temperatures, humidity and heavy dews of the previous week, with Fusarium quite noticeable, though if possible I’d still try and grow it out rather than spraying (If this is a viable option). I’d expect more activity from Dollar Spot and Red Thread on the back of that humidity, but this should decrease later this week as temperatures slide and with the absence of heavy dews. Plant parasitic nematodes (PPN) are also quite prevalent at present given the dry conditions and high population counts (August normally marks a 2nd hatch of most species of PPN’s), so expect to see some evidence of activity if you’ve had problems in the past. The lower temperatures of this week, coupled with strong winds will no doubt knock the colour out of some areas, so I’d look to pick them up early next week after we get the strong winds out of the way at the end of the week. Light rate foliars with iron are the order of the day here. If you’re on a PGR program on greens, I would not be including any in these sprays as lower temperatures and shorter days will take the edge off growth naturally. You also have to have one eye on the fact that when you finish applying PGR’s, there’s always a growth flush roughly a month after the last application as the plant comes out of the effect of the growth regulator. That’s why I’d suggest finishing applications now because you don’t want a growth flush at the start of the main Fusarium pressure time (Early Oct). This entry was posted in Mark Hunt's Weatherblog on September 10, 2012 by mark.hunt. After an unsettled and wet week, last week, we’re into a spell of fine autumnal weather, though cloud cover may sometimes make the sun elusive. August finished off with the coldest night ever on record for some places last Thursday night, with a grass frost reported by a number of you (thanks Rob). No risk of frost this week you’ll be glad to hear. 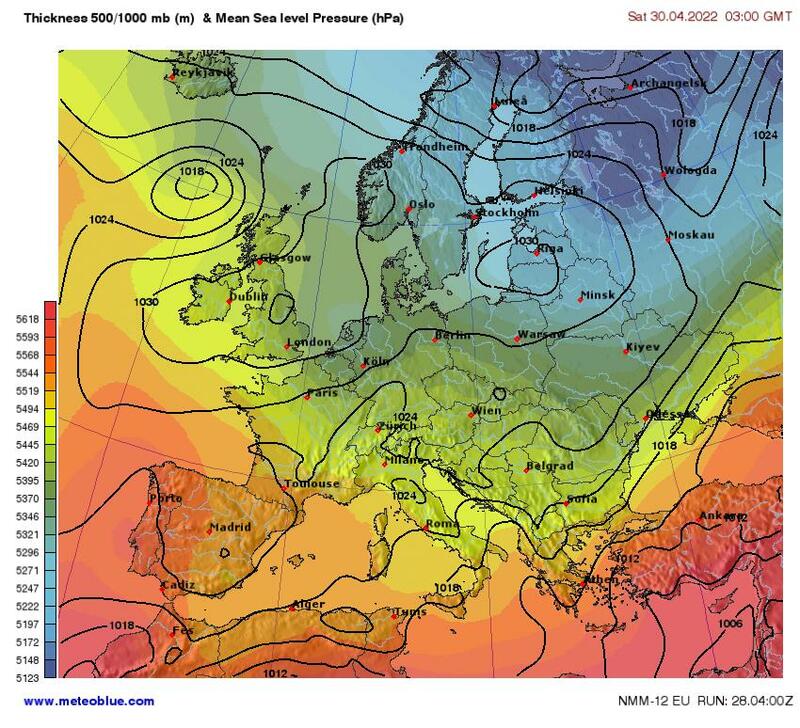 Followers of this blog may remember that in the last week of September 2011, I reported a blocking event caused by a high jet stream position (see right) that provided warm and dry weather from then, right through to the 1st week of April 2012, almost un-interupted. I mention it because that’s where the jet stream is this week. It’ll be interesting to see if the blocking event occurs again and if it takes the same form – remember that if it aligns further west, we end up in a trough, rather than under a peak, and that means a very cold late autumn / winter, such as we endured in 2010. I see Paddy Power are giving 7/2 on a White Christmas for 2012, hmmm tempting…. The image on the right taken from our Cambridge office (we can afford windows now!) tells the story of this week, as this is a Cirrus cloud formation and it’s often associated with high pressure systems. That means for most of the UK and Ireland, we’ll have dry, warm conditions, though ultimately the day temperature will depend on cloud cover and that’s a difficult variable to predict. We have a very active low pressure system skirting the top of the UK, so for Scotland they’ll be gale force winds and rain for the start of the week and also from Thursday through to Friday, as another low pressure skims the top of the U.K. It’ll be worse the further north you go in Scotland. For the rest of us, we’re looking set fair for the start of the week. Tuesday will bring a weak band of rain for Ireland, which will push westwards into Wales later in the day, but decreasing in intensity all the time. For the rest of the week, we’ll be dry and warm, with temperatures ultimately dependent on cloud cover and that’s likely to be significant, particularly early on in the day. The dry weather for most will decrease the activity of disease pathogens on the whole with Fusarium taking a back seat. The heavy dews will however continue to encourage Red Thread and Dollar Spot activity, particularly on higher height of cut areas, like tees and fairways. For many, the latter isn’t a disease of note or one that affects their golf course. This year, it is more prevalent and occurring on courses with no previous history of the disease. For your information, it likes a wet surface and so often shows as a few spots early in the summer, (June-July), declines thereafter, only to appear with a vengeance in the autumn, with the onset of heavy dew formation. It follows then that one method of discouraging this disease is to keep dry surfaces and maximise surface water movement. Secondly, it likes a weak, impoverished plant, so low N is a calling sign for Dollar Spot, with Fescue and Rye top of its ‘munch list’. There’s a lot we don’t know about this disease, which is strange given its prevalence in the U.S and on the continent. Soil temperatures are holding up well, currently sitting in the mid 15’s, so that means light-rate liquids and water-solubles will continue to be the order of the day in my mind nutrition-wise. As mentioned last week, it is key to go into the end of this month nicely in control of your grass plants nutrition, so you’re not caught out with flushes of growth, a plant leaf high in N, succulent and an easy target for Fusarium. With temperatures still up and moisture levels good, this is a great time to hit weeds, a job that many missed out on earlier in the year because of the weather or if they did apply, the weeds have simply re-grown, particularly those with a big tap root, like Plantain and Daisy. Think that’s it for now, enjoy the autumn. This entry was posted in Mark Hunt's Weatherblog on September 3, 2012 by mark.hunt.